Meeting Tom (red jeep guy) again! More beer! But the good news is, we made it! It wasn’t actually that bad, but I think I’d had enough after 2 days. Dan had had enough after 2 minutes. On 8/20 we walked right into Rawlings, Wyoming, home of: an all-you-can-eat Thai buffet, the Mennonite Discount Grocery & Bakery; and the restaunt with the best bacon avacado sandwich ever…. in 2004, unfortunately it had now changed ownership. Still, it was a good ner-o. 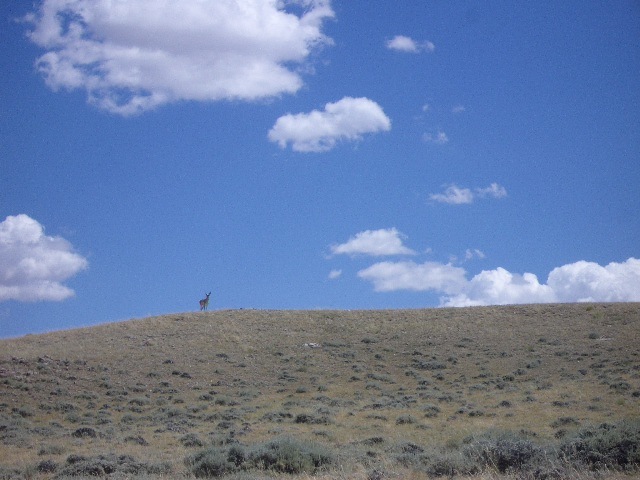 8/16 – We left Lander and walked to South Pass City, a city that grew up around gold mining and later served as a resupply stop for those headed west on the Oregon Trail. It’s now been beautifully restored and is a state park. We had a look around, signed the trail register and then made use of the picnic tables to have a lovely lunch. Myke & RT had Subway sandwiches and Heaps & Joker were enjoying tortillas with avocado, cream cheese and Chulula hot sauce . I was eating dry crackers and Dan was having cold oatmeal. Oh the jealousy! Joker has been our food advisor on the trail. 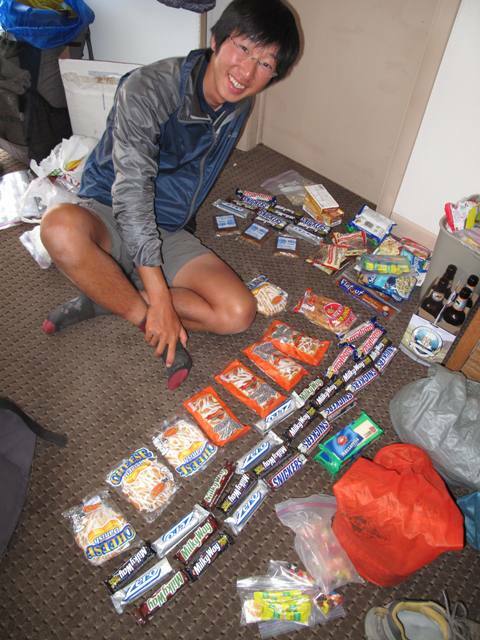 He is full of unconventional wisdom and unusual trail food choices. Most people recommend dehydrated, lightweight food but after a while your tastebud object. Joker, on the other hand, would carry 1 bag of chips per day, avocados and now – a glass bottle of hot sauce! Not your typical resupply but tasty indeed. Joker truly has a love affair with Chulula….. but the good news is we’ve been invited to their wedding! First, he just has to find her! 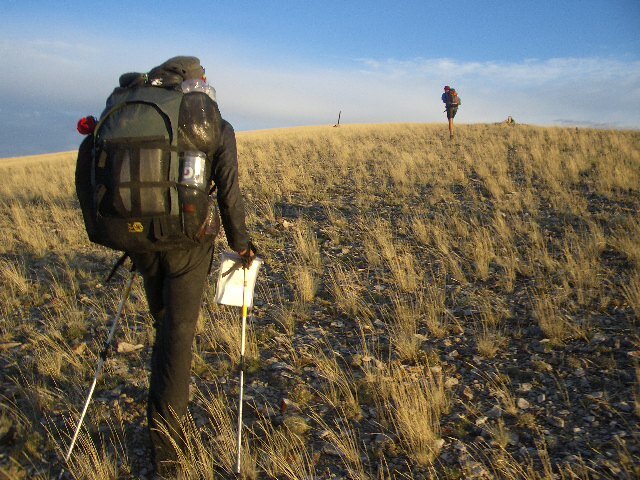 We were beginning a 120 mile section in and around the Great Divide Basin, an area where the Continental Divide Basin splits and creates a circle. Since this area is relatively flat, the water that falls in this basin never reaches the Atlantic or Pacific Oceans. This may lead you to believe the Great Divide Basin (GDB) is lush, but in reality it gets barely any rain so it’s a desert of sage brush and alkali flats. Lack of shade and water are serious concerns in the GDB, so imagine our surprise when we found ourselves in the thunder and lighting storm of the century on the first day out. There were no trees, nothing to serve as a lightning rod (except for Heaps, as he’s 6’7″) and we also had to cross 2 mud/swamp pits where the water reached my upper thighs. The lightning was spectacular, lighting up the horizon for miles in the distance and shifting constantly so that it seemed to be coming at us from all sides. Thankfully we weren’t struck, though it did take us a while to warm up after the sun returned. 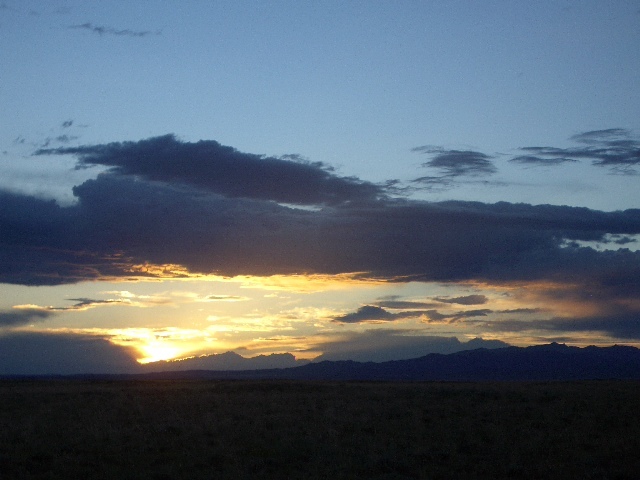 We could see the mighty Wind River Range reduced to small blue silhouette on the distant horizon. That evening as we walked on the endless jeep road, continually intersecting the old Oregon Trail and California Trail, a rusty-red jeep lumbered towards us. The driver, a friendly man named Tom, stopped to chat and (drum roll, please) offer us a few beers. What a way to end a day! 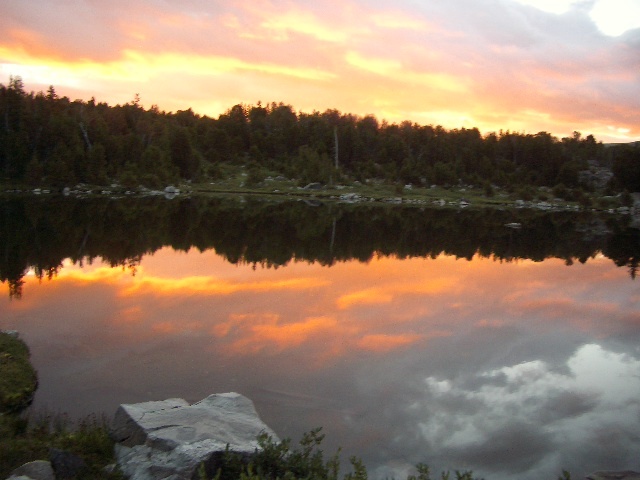 August 14th – We celebrated 2 months on the trail, having traveled about 1160 miles! We were also very thankful that travelling Trail Angel extraordinaire Naomi was picking us up when a Wyoming State Trooper stopped to “chat” with us as we waited by the highway. 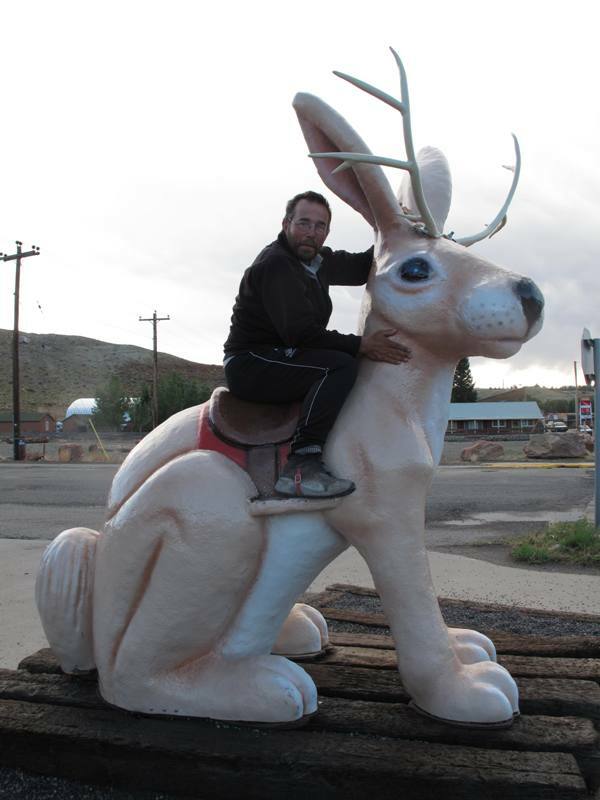 Hitchhiking is illegal in Wyoming and we’d heard a few stories about thru-hikers getting in trouble. But sure enough, right at 11am, Naomi pulled up in her PT cruiser (rental car) and we reunited with the rest of the group there too, and headed off to our next town, Lander. Lander is where NOELS (National Outdoor Education Leadership School) is headquartered and had a more progressive/hip vibe to it than most of the previous towns we’d been to. We ate a scrumptous dinner outside at the Gannet Grill, where we met up with Wing It & Don’t Panic and Lost and Found. On the 15th we enjoyed ANOTHER zero day (love um!) and this day shall forever be remembered as the infamous Boston Cream Cake Challenge Day. Hopefully I can get the whole slew of photos/videos from RT, but let me just say it started with 3 enormous Boston Cream Cakes and 3 happy cake-loving contenders (RT, Joker & Heaps) and ended with some remaining globs of cake, a huge pile of chocolate frosting and 3 miserable comatose cake-hating hikers. 8/11/10 – We were excited to re-unite with Kombucha, Hawkeye, Joker, Rolling Thunder, Myke and Stretch that morning…. they’d had a shorter but also arduous bushwack to Clear Lake. The next day I got sick, vomitting several times before sadly deciding to skip the Cirque of the Towers, a cirque of mountains that required an bushwack up to 11,000+ feet. Everyone else did the Cirque, except Myke who was eager to meet his wife Naomi in Lander. Hawkeye had had a similar stomache bug the past few days. I don’t think the 1.5 days of insane climbing cross-country put my imune system in a very good state. But despite my bubbling, aching tummy we made it over Temple Pass on 8/13 and met Pace, Coach & Whitefish by Little Sandy Lake. We’ve named them “Team Flip Flop” because they’re thru-hiking the CDT this year but have flip flopped all over the place. They started in New Mexico, hiking North, then flipped up to Canada and began hiking south with some other sections in between. Coach & Whitefish also did the PCT in 2009. 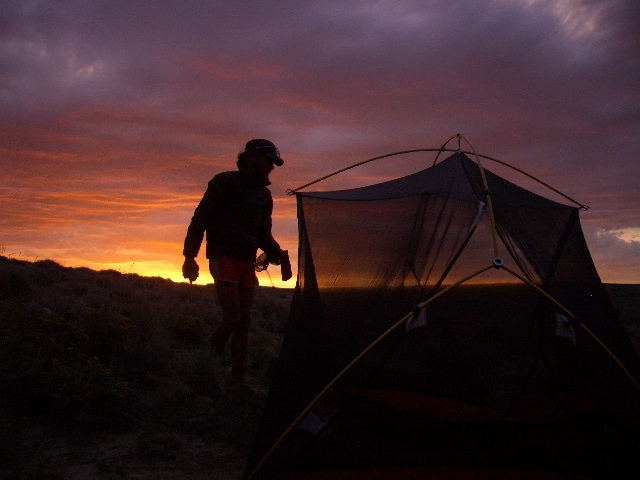 I’m pretty sure that the majority of the CDTers this year hiked the PCT in 09 like us….. so far there’s us, Kombucha, Joker, Rock Steady, Myke, Heaps, Sage, Ice Ax, Snorkel & Frogger, Pi, Coach, Whitefish… and I’m sure I’m missing some. Total there’s only about 25 thru-hikers going north (NoBo) and about 25 going south (SoBo). Anyhow, they were friendly but unfortuantely we probably wouldn’t see much of them since from Hwy 28 they would skip ahead to Rawlins since they’d already done the Great Divide Basin. Our last few miles to the highway were on a dirt road, not very scenic but fast miles and easy terrain. 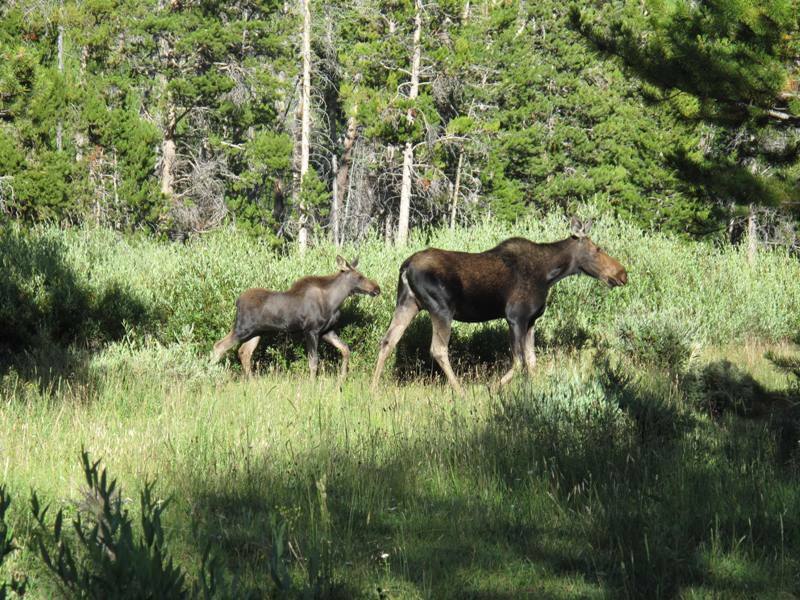 And as we were leaving the woods we saw a mama and baby moose in a swampy meadow….. I can’t say they’re the most beautiful animals but it was still an exciting wildlife viewing! 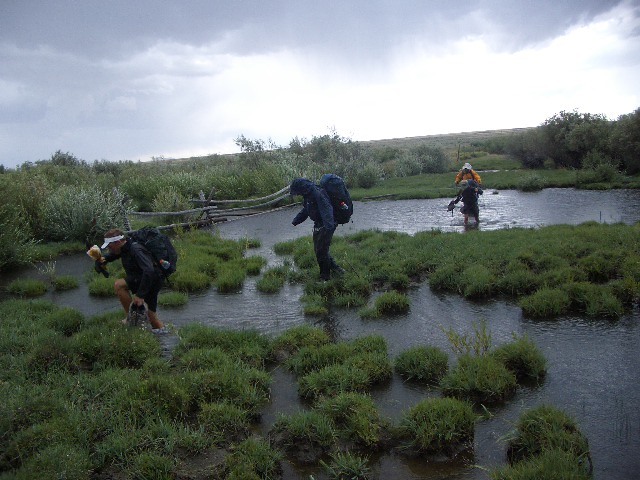 8/10 – We anticipated it only taking us a few hours TOPS to follow Pixley Creek cross-country back to the actually trail along the Green River. However we spent until noon that day scrambling/rock climbing/boulder hopping/down-climbing waterfalls. When we first got low enough to see grass and wildflowers it was thrilling. 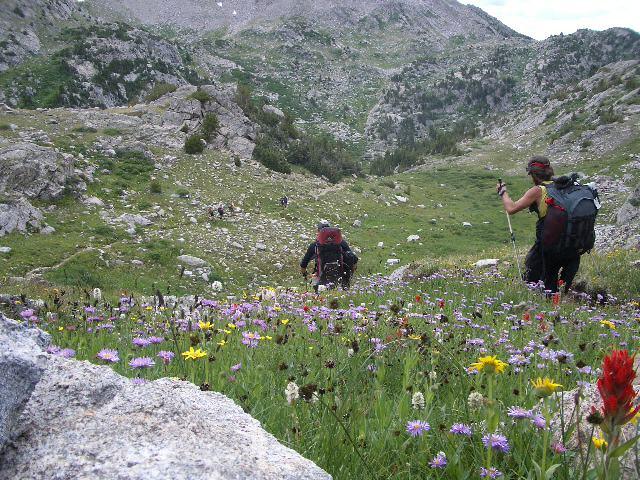 The precious Indian Paintbrush, Aster and Alpine Arnica had never smelled so sweet. Then we were filled with a similar joy at the sight of our first tree….. until we were having to push our way through tree branches and climb over downfallen logs. When we finally reached the trail Dan & Heaps just sat there, soaking up the joy of a pleasant dirt path for us to follow…. the gorgeous scenery continued with Vista Pass & Shannon Pass… alpine meadows brimming with wildflowers and dotted with granite rocks, numerous lakes and streams reflecting the intense blue sky and NO mosquitos! That was a true blessing! 8/7 – 8/8 We started in smaller groups but strangely enough ended up re-uniting after a bushwack around Lava Mountain until Tok, Lost & Found decided to stick to the Red Route (the official route) while the rest of us headed to Union Pass on the Purple Route (an alternate). On 8/9 Rock Steady, Heaps and us set off on the Rainbow Route to top all Rainbow Routes (cross-country routes we made up). It started off with sunrise that turned everything in its light a pale shade of pink. Then we startled two buck elk who posed majestically on the hillside before crashing off into the woods. Ascending the rocky meadow near Shale Mountain, we looked down on alpine lakes whose water was steely grey in the morning light. As the sun rose the lakes changed from a milky turquoise to a placid cornflower, and still we climbed. We crossed some permanent snowfields and were up on the Divide climbing up yellow-tinted rock when we decided to stop for lunch. Rock Steady decided to go on ahead. 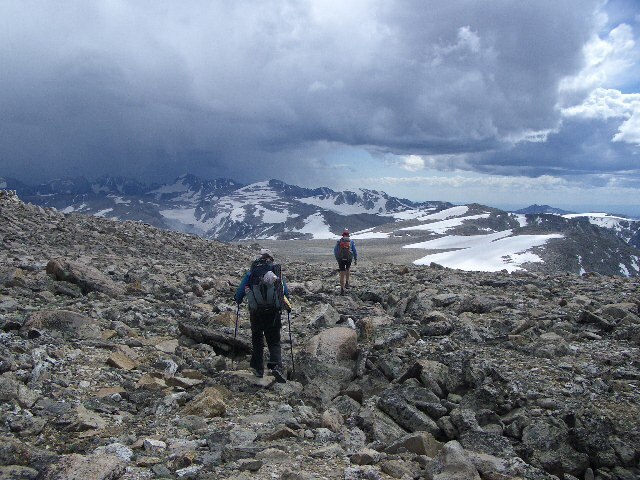 Our plan was to be down off the divide by the afternoon since we’d had some intense thunder and lightning storms the past few days, but we were making much slower progress than anticipated. Still, we found time to cross Continental Glacier and scramble up to Down’s Peak, a 13,260 foot rock pile perched on the Divide. Thankfully, though, the weather held…. 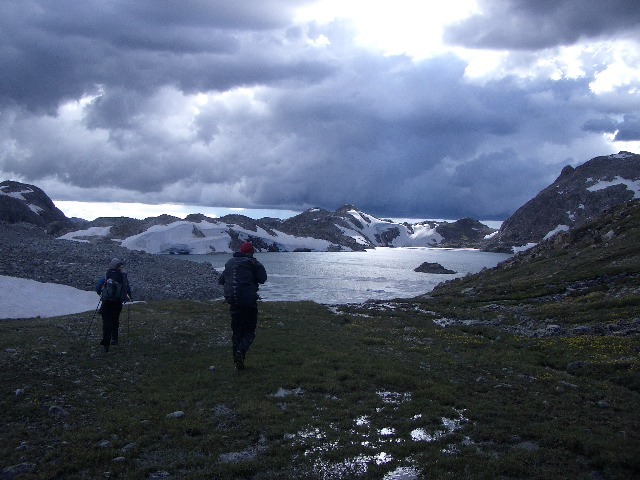 we heard a rumble of thunder and had some brief hail/snow flurries on our way down but the most threatening clouds seemed to just blow on past us. Nonetheless, we were making pathetic progress and using muscles normally dormant on a thru-hiker. But the scenery was getting more and more spectacular. In the distance we could see Gannett Peak, the highest mountain in Wyoming, and a dozen other granite towers and peaks. We enjoyed a small section of flat ground before traversing around Yukon peak, and glissading down to the glacial moraine between Baker & Iceberg Lakes. As we came around a bend we saw a huge serac – a massive cliff as if Sourdough Glacier had been sliced open – and Klondike peak above. We thought the going would get easier now that we were off the Divide, but the size of the boulders just increased and at one point we were forced to backtrack when we hit an impassable cliff face. Still, elated and exhausted we arrived at a semi-suitable camp spot and disappeared into the safety of our sil-nylon just in time to hear the rain begin to pound our wind-blown shelter. What a day! 3) By the afternoon when Stretch & Found arrived there were a baker’s dozen thru-hikers in town (also Kombucha, Hawkeye, Joker, Rock Steady, RT, Heaps, DnA, Lost, Mike with a Y, Rambler/Tok) … and for much of the time we were all gathered in one room! Thankfully there was also a pool and (lukewarm) hot tub. Rock Steady and Trail Food! The next section was going to be a long one – 160 miles, including some alternate routes and bushwacks – so that meant lots of food and HEAVY packs. But it was bound to be worth it…. 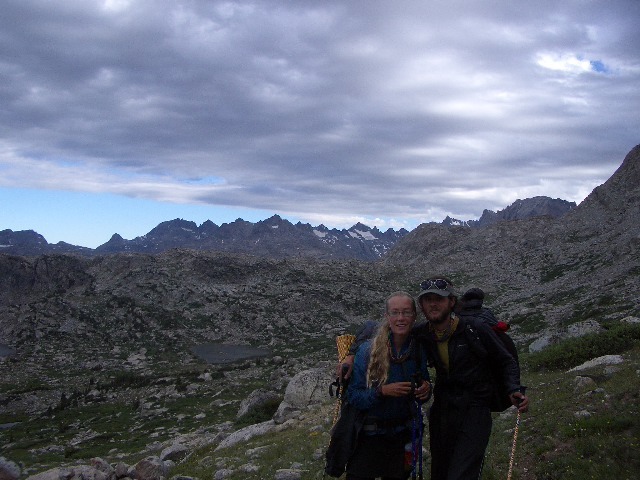 coming up was the Wind River Range!